So as you may know, I am mixed race with naturally curly hair, but I always seem to straighten it or blow dry it out to achieve length. I recently started to think about going natural more often as it would help my hair repair damage and strengthen. I was in search for something that would help maintain my curls, nourish my curls and keep them soft and smelling sweet. I came across company Argan Dew and thought I would give it a go! I have tried the “Miraculous Argan Oil (daily treatment) and the “Intensive Replenishing Hair Mask”. Bare in mind that as I have an afro hair-type, I only wash my hair about twice a week max, and my hair also benefits from lots of oil where other hair types may suffer. "At the heart of the Argan Dew hair care line lies the natural and versatile richness of pure Argan oil, which in its natural, purest form already contains all the moisture, essential vitamins and antioxidants needed to nourish and rejuvenate the scalp and hair." Miraculous Argan Oil- So I used this product on my wet hair after a general shampoo wash and condition. I usually turn to a leave in conditioner, wash out hair mask or oil like coconut or caster after washing. I massaged the oil into my damp hair working most of the product from the ends up to the root. I then used a wide-tooth comb to work out any tangles and spread the product further. I always wash my hair before bed so it dries naturally overnight instead of using heat. I woke up to extremely soft, nourished curls. I also felt that when using hair straighteners, my hair had an added level of protection. Over time, with using this product on my hair ends especially and applying less heat, I am hoping for my hair to be restored and growth to be enhanced through the new healthy ends. Intensive Replenishing Hair Mask- I love a good hair mask! They are great maybe once every one or two weeks to grant your hair moisture and a deep condition. This Argan Dew Hair Mask was my favourite of the two products I tried. I washed my hair as usual with a nourishing shampoo and conditioner. I then applied the mask to damp (not dripping) hair and left for about 5 minutes (while I made a green tea :p ). I then washed out using tepid water and left to dry naturally. This morning when I woke up, I was so pleased with the results! My hair was firstly SO SOFT to touch. It smelt wonderful and all my curls were fairly defined with minimal frizz. I felt like I could rock my natural curls after a running light oil serum through. This is a fab hair mask for those who have never tried one before or for someone looking for a nourishing, repairing product. I can’t wait to use my second sachets of each product. Next time, I will use them in conjunction with one another. So apply and wash out the mask, then use the oil! I am looking forward to those results! 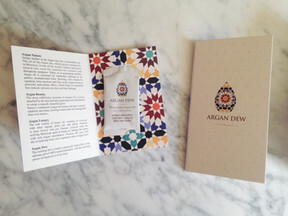 Argan Dew can be bought online.